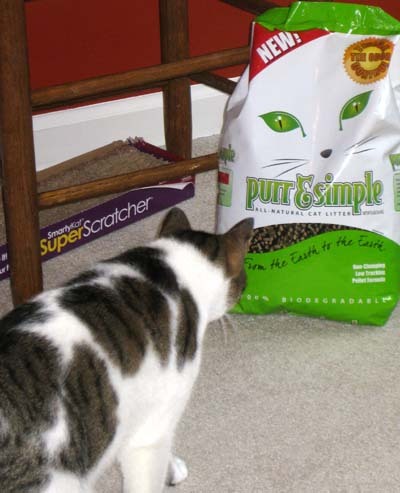 Purr & Simple is a kitty litter made from the shells of tree nut crops in Northern California. It’s all-natural, biodegradable, compostable (with solid waste removed) and totally made in the United States. As if all that isn’t good enough, Purr & Simple is also low dust (and silica dust free), which is good for you and kitty cat. I think making cat litter from nut by-products is genius. More specifically, it’s the genius of Eco-Shell Inc., founded in 1995. According to Eco-Shell, independent labs tests have shown that Purr & Simple absorbs odors better than leading clay, wheat, pinewood and corn litters. I’ll be sure to let you know what my nose says too. 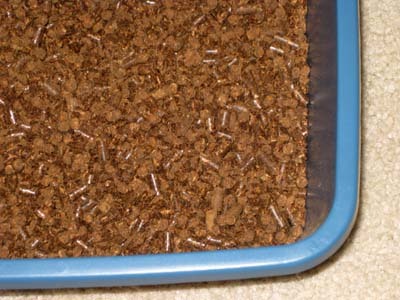 Purr & Simple comes in pellets (pictured) and clumping formula. I’m currently trying out the pellets formula. I’ll post a review once the cats have had a few weeks to stomp around in Purr & Simple, but for now I wanted to let you know about this new, very eco pet product. I called my local independent pet store, and they’re selling Purr & Simple at reasonable prices. I think it may even be cheaper than the corn litter I’m using now. Of course, prices may vary according to your location and store, but my Hollywood Feed is selling it for $7.99 for an 8-pound bag or $14.99 for a 20-pound bag. The clumping litter costs a bit more: $9.49 for 8 pounds and $15.99 for 20 pounds. Have you used new Purr & Simple cat litter? So many great reviews of this litter but I have a couple questions. • does it come in any other packaging or is it just plastic packaging ? I’m really on the search to change litters ASAP 🙂 I look forward to hearing from you . Hi Olivia. No, I’m using World’s Best Cat Litter. It’s what my cats prefer. If your daughter has a tree nut allergy, I would not use this.